My son did a class yesterday all about Father’s Day. We made this Daddy Rocks Paperweight. Ours says Papa Rocks or My Dad Rocks would also be cute. 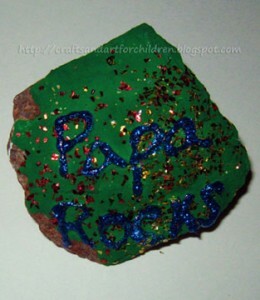 My son paint a rock with green paint and then sprinkled glitter over it. I wrote the words with puffy paint. When it finished drying, I wrapped it in tissue paper and and curly ribbon. 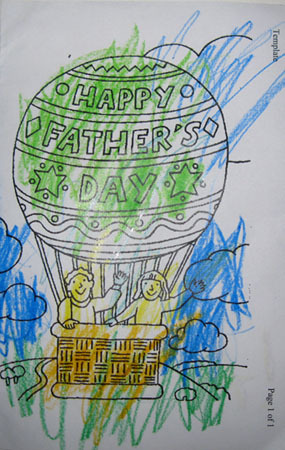 He also colored a Father’s Day Card. 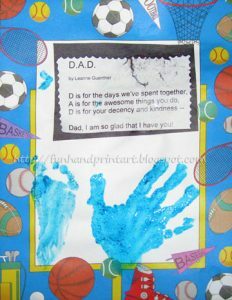 In the beginning of class, the kids & moms did a circle time where they learned 2 Father’s Day Songs. My little guy can’t wait to sing them to his Papa on Sunday- he was practicing all day yesterday! The kids also got to make this Handprint & Footprint Keepsake Gift. 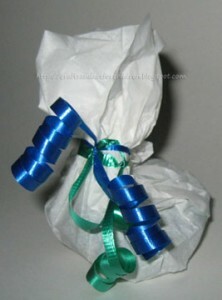 Hop on over to my other blog for the full details and to see the poem. I have been looking for cute, easy songs- thanks!! !